Coexisting With Nonhuman Animals: Homekill movement: "Industry Does Well Slaughtering Meat Prices"
Homekill movement: "Industry Does Well Slaughtering Meat Prices"
The Southland Times article "Industry Does Well Slaughtering Meat Prices" covers "homekill", when a small operator will drive out to a farm and shoot animals to death, before dropping their body off to a registered butcher to handle the rest, then delivering the "meat" to the animals "owner". "Homekill in Southland is humming but competition can be cut-throat. Shawn McAvinue talks to four companies making a killing in Southland. Homekill is nothing new but more slaughtermen are surfacing in Southland. Lumsden slaughterman Ray Orchard said killing beasts has grown his business steadily since he started six years ago. The sole operator used to kill about four cattle a week and about 140 sheep, but now he slaughtered about a dozen cattle and 60 sheep, and the odd pig and alpaca, he said. "Eighty per cent was for dog tucker. Now two thirds is for the table." After the television show Sunday investigated the popularity of homekill in April his business boomed, he said. Business had been so good he bought a new refrigerated truck. Mr Orchard slaughtered animals for clients and then recommended a butcher." "Slaughterman Trevor McMullien said he was empathic when slaughtering animals by ensuring no children or women saw." 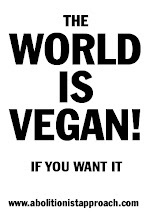 Goodness, cant let any children or women see as we big strong men kill animals for the children and women to then eat!!! "He slaughtered about 15 beasts a week but sheep slaughters dropped to about 30 a week when the meatworks gave farmers better prices, he said. However, lifestyle block owners around Invercargill were becoming a bigger part of his regular clientele, he said. His partner Catherine Julian free-flow packed the meat beautifully, he said." "Most beef was slaughtered before winter when the cattle were in the best condition so there was a spike in slaughtering, he said. He did not advertise and in a busy week his company would kill for 200 customers, he said. Half the slaughter was beef, then sheep and a few pigs and deer, he said. Homekill was popular because people got fillet steak for the price they were paying for mince in the supermarket, he said. Isla Bank butchery slaughterman Tim Ellison said knowing how to walk into a paddock with his .243 calibre rifle was a skill. "There's a lot more to it than you think. What is the animal thinking? What if he gets toey? Could he jump a fence?" Aranui Skins managing director Darryl Gerken said most slaughtermen dropped off their skins to his business in Gore. He sold the skins to exporters in Christchurch and was the only company accepting cattle and sheep skins from slaughtermen, he said. "Homekill is getting busier and busier every season." He had owned the company in Gore for seven years and he bought more skins this season than the past one, he said. When the recession hit in 2008, hides were worthless so slaughtermen threw them away, but good prices returned in 2010, he said. Prices for sheep skins were falling, mirroring falling wool prices, but the price of cattle hides was stable and they sold well to Italy, he said. About 15 years ago, the company got 1500 sheep skins but now it was about 350, he said. Good prices for mutton at the meatworks meant farmers bought rolls or biscuits for their dogs rather than killing a sheep, he said. 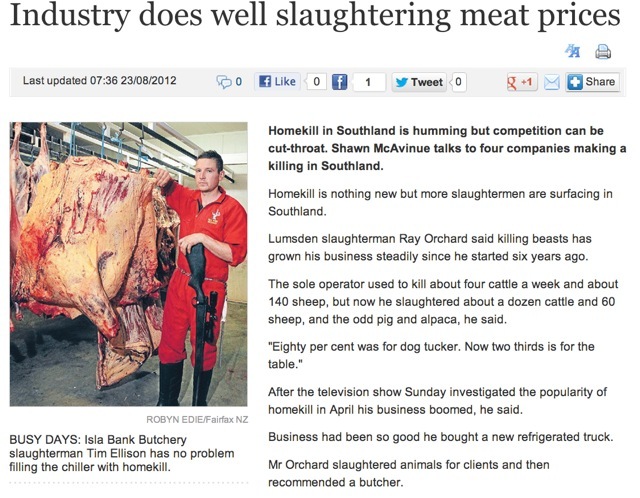 He estimated about 4000 beasts would be killed by slaughtermen each year in Southland"
The Southland Times "Industry Does Well Slaughtering Meat Prices"
Two Asian Grocery Stores Opening in Invercargill!